"These postcard meditations call into question what America means by 'we,' and why many feel that the presence of immigrants means there isn’t enough barbed wire to keep them ('us') out." 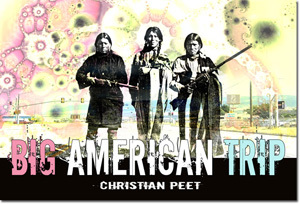 Christian Peet’s Big American Trip (Shearsman Books, 2009) is entirely composed of poems “hand-written” on imagined postcards by an “alien” of unknown nationality, ethnicity, and gender traveling across the United States (according to his biographical note, Peet has driven across the U.S. numerous times, camping in all but five states). The book’s format opens like a book of postcards; in addition, the book invites the reader online to view video interpretations of the poems performed by various artists (bigamericantrip.blogspot.com). are harvested by illegal aliens, are delicious. are harvested by illegal aliens are delicious. It’s interesting to imagine Peet writing these postcards and deciding whom to address them to; it’s also fun to imagine the individuals/organizations receiving such cryptic postcards. These postcard meditations call into question what America means by “we,” and why many feel that the presence of immigrants means there isn’t enough barbed wire to keep them (“us”) out. Dried snake on the roadside. Sage brush in gray rock. Three postcards are entirely composed of pasted clippings: the first is a job listing of “Available Non-Management Positions,” the second is an article about a group of U.S. soldiers in Iraq who named their camp in Iraq after a KOA campground, and the third is a description of a Michigan Law Enforcement course called “Spanish for Criminal Justice Response Professionals.” These poems testify to the complex, formal range of Big American Trip. or the time is disappeared. Throughout, Peet questions the dominant narratives and discourses of American empire and culture in profound ways. In a sense, there is no single narrative, but “between lithosphere and atmosphere / of imitation, is this ‘lyric’ ‘body’ of ‘work.’” Of course, Peet questions even the linguistic designations of lyric, body, and work because words don’t capture the complete atmosphere of their referents. Finally, Peet notes: “the ‘lyric’ is // written with a hand of the tremor.” Indeed, the lyrics of Big American Trip are written with a hand of the tremor—a tremor caused by the unstable surfaces and underlying forces that constitute the history, language, politics, economy, and culture of the nation.